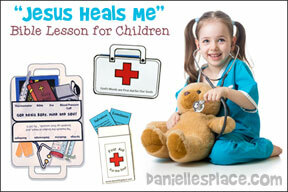 Printable Bible Phrase Cards: Print out the cards onto cardstock, cut them apart, and send one home with each child. 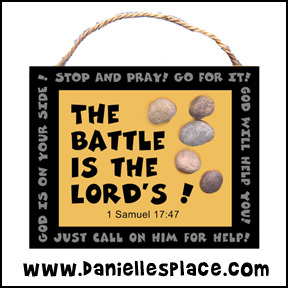 Teaching Concept: God helped David fight the giant and he will help you too. Before class print out the pattern onto pretty colors of cardstock (heavy paper), and cut them out. Bring in some small smooth river rocks. Let your children each pick out five rocks. As they try to decide which ones they would like, tell them that the person in the story today had to pick out five, smooth stones also. We will find out what he used them for at the end of the story. When a child has picked five stones that he likes, place a small dab of tacky glue on each stone and let him decide where he would like to place them on his wall hanging. To finish, add a string or yarn to the top of the wall hanging. NOTE - This craft is for children five or older. Younger children could choke on small stones. Make sure the stones won't fall off the paper; and hand the wall hanging to the children's parents when they show up to pick their children up. Be careful not to leave any small stones behind. 1. Fold the top of the bag down towards the inside of the bag 1 1/2". Fold it back three times so that your bag stands about 5 1/2" high. Punch 14 holes in the bag evenly spaced. Punch four in the front, four in the back, and three on each side. 2. 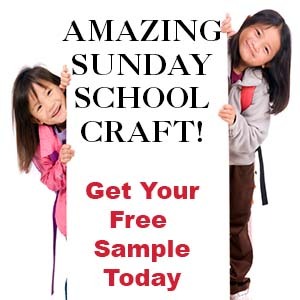 Make a sample craft. Cut a length of string and weave it in and out of the holes starting in the front. Cut more string the same length for your students. 3. Print out the bag labels onto brown paper, cut them out, and glue to the front of the bags. 4. Make play dough or buy it. You will need red, green, yellow, orange, and blue. To make the dough place a 1-pound box of baking soda, one cup of cornstarch, and 1 1/4 cups of cold water in a saucepan. Cook over low heat until the dough looks like mashed potatoes. Remove from the heat. Cover it with a damp cloth until it cools and then store in a plastic bag. This dough gets very hard. It feels a little gritty so have some wet paper towel available for the children. 5. 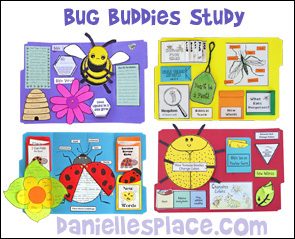 You can also include a little booklet that explains what each color represents. 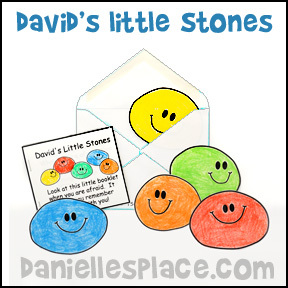 See "David's Little Stones" craft below. Preparation: Before class draw a big ugly face on a piece of poster board. Bring in a yard stick or ruler, and measure up nine feet, while standing on a step ladder or something secure, mark off nine feet to show the children how big that is. Tape the face to the wall at nine feet. Optional: Prepare armor for Goliath. Go to the Armor of God lessons for ideas. If you don't have time to prepare these things, just use anything you can find around your house as a substitute. You can use the top of a garbage can for a shield, a large coat or grocery bag for the coat of armor, a broom for a sword. Or you can bring in a roll of aluminum foil and quickly make the outfit as you talk. Goliath will look silly, but that is okay because he really was silly thinking he was so strong. You will also need a basket with food in it. Have you ever been dared by anyone to do something? Have you ever dared someone to do something? Usually when we dare someone to do something, we are too scared to do it ourselves. (Talk about dares. Let the children share their ideas and experiences. Talk about how it is wrong to dare someone to do something that is dangerous or bad.) It is wrong to dare someone to do something to prove that they aren't scared. The Bible tells us to treat others as better than ourselves. Open your Bible to 1 Samuel 17. Our story today is about someone who gave a dare. He thought he was tuff and he wanted to prove it. He was a big man. As a matter of fact, he was considered a giant. He stood over nine feet tall. (Point to the face of Goliath on the wall.) Goliath was that tall. Yes, Goliath was a big man and he thought he was better and stronger than anyone and he wanted to prove it. David could see that they were all afraid. But David wasn't afraid; he spoke up and said, "I'll fight Goliath." (Have "David" repeat your words.) David wasn't afraid because he knew that God was with him. He remembered the times that God had helped him before. Once he had helped him fight off a lion that was attacking his sheep. And another the time God had helped him pull a lamb from the mouth of a bear. 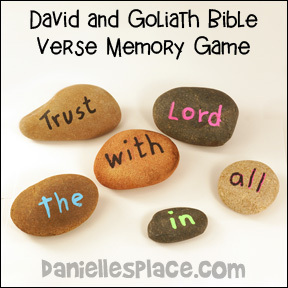 Conclusion: Goliath thought he was a big, tough man, but he forgot two important things -- God is stronger than anything or anyone, and David had God on his side. 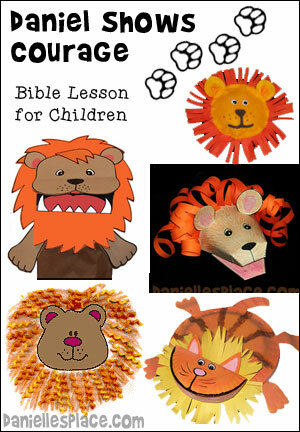 This craft comes with a printable mini booklet that will help children remember that God is with them. Each colored stone represents a way children can trust in God to help them. They can color the stone patterns and write Bible verses on the back of the stones, and store them in an envelope. 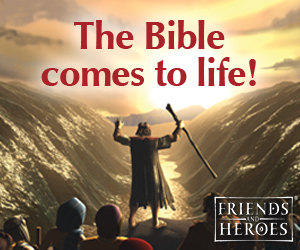 Join today for $23.95 per year and have access to all Bible lessons and patterns. In a medium-size saucepan, stir together all the ingredients. Cook over medium heat, stirring constantly, until it resembles mashed potatoes. Place the dough in a bowl and cover with a damp cloth until it is cool. Store in a plastic bag. 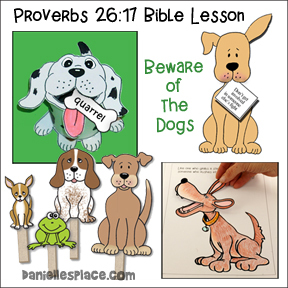 Children look up the verse and use it to cross out all the word in the verse to reveal what David said. 1. Before class print out the Goliath pattern onto card stock and fold back the two sides so that it stands up. 2. In class line the children up in a row and ask each child a question from the lesson. If the child answers the question correctly, let him or try try to throw a bean bag at Goliath to see if he or she can hit him in the forehead. If a child doesn't know an answer, give him some clues until he can figure it out or have a friend help him. 1. Place dots of different colors on the underside of each rock; make sure you have two dots of each color. Turn all the rocks over so that the dots are hidden. Let the children take turns turning over rocks to see if they can find a match. Make more than one game if you have more than four or five children. 1. Before class write words from the Bible verse on one side of the rocks. 2. In class place all the rocks on a table in the center of the children with the words face down. 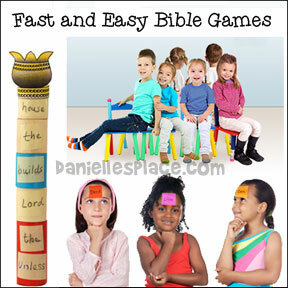 Have the children takes turns turning over the rocks trying to find the words of the Bible verse in order. If a child finds a word in the correct order, he gets to keep the rock. The child with the most rocks at the end of the game wins. Children sit in a circle. 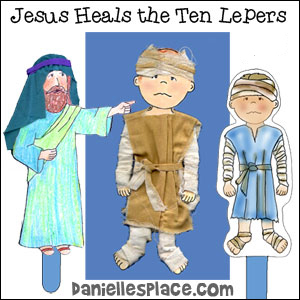 One child walks around the circle tapping each child on the head saying, "David, David, David." When they say "Goliath," "Goliath" chases them around the circle back to Goliath's old spot. Then Goliath starts, "David, David", etc. 4. Sing "Knock Goliath Down"
Sing to the tune of "Did you Ever see a Lassie?" Did you ever see David knock Goliath down? Goliath fell to the ground. 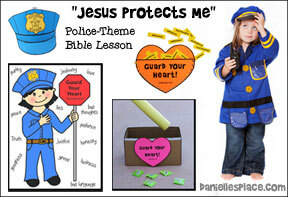 I teach at our church's Little Church School for 3-5 year olds on Sunday mornings. I just found your site recently and am overjoyed to have such a fine resource. 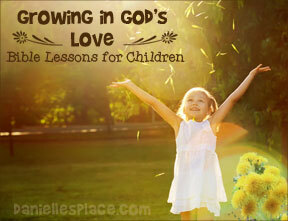 Just recently I used the David and Goliath Lesson Plan with some modifications to great success. For the craft I printed out the David's little stones sheets off my computer, cut the pages out and used glue stick to place each on color-coded card stock cards that were slightly larger so a border could be seen. I hole-punched all cards and tied a piece of red yarn to hold the book together. I put a paper clip through the yarn at the back of the book for later use. I used light blue felt for stone pouches. I cut 10 inch circles out of the felt, and with a big needle sewed all around the edges within 1/4", leaving a five inch end where I started and where I finished so the ends could be pulled and the pouch, gathered. I also made some sample slings out of 5 inch brown felt circles, sewed on both sides to gather edges and make more of a cup shape. I punched a hole on both sides and tied two-feet pieces of twine to the sides. We practiced swinging the slings and slinging marshmallows at a nine-foot high head of Goliath I had drawn on paper and taped to the wall. 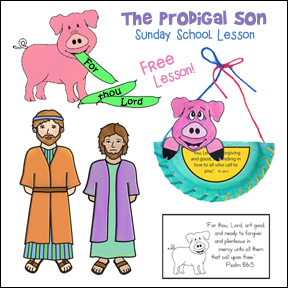 We did this after the Bible story and before the craft just to get the kinks out - the kids got in about 4 lines and each took turns with the slings. I did the lesson on David and Goliath for our after school kids club (ages 4-13) I took the idea of making a large 9-foot giant. We hung our 9-foot giant in the chapel where the lesson was. We used it as a growth chart, and marked where everyone measured up the giant. We also took their pictures with the Giant with a Polaroid camera. I have to admit that seeing a 9-foot giant was pretty amazing and intimidating. We left the giant up in the chapel for Sunday so the adults could see Goliath. Having the giant during the lesson really helped the kids visualize what David was up against. The kids loved the 5 stones craft. They made little booklets that had the meaning of the 5 stones, as well as our memory verse for the week. 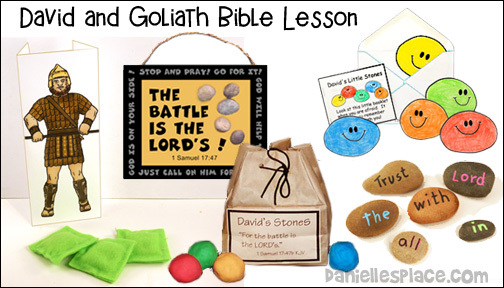 To go with the 5 stones craft, we enjoyed David & Goliath snacks. (Banana cut into 2 pieces, one being larger than the other; pretzel sticks for arms and legs, peanut butter for glue, raisins for the face, and a maraschino cherry for Goliath's helmet. 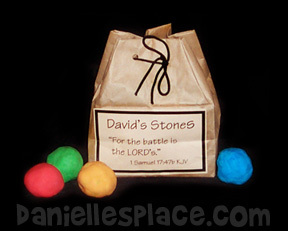 We then used M&Ms (the colors that correlated with the stones in the 5 stones craft) has David's 5 stones). The kids loved playing with their food while learning at the same time. Thank you for a great lesson. We did the lesson several weeks ago, and the kids still can remember our Giant, and the fact that God is with us no matter what we face. 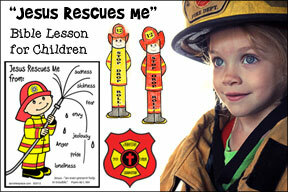 I am currently writing-compiling a "Building Christian Character" Unit Study for my 3rd-5th-grade class. We are covering different characteristics each Christian needs in there life. i.e.. Compassion, gratitude, generosity, etc. We are currently on the characteristic courage; it's meaning and application. For this I used the story of David and Goliath. These five little stones remind me of many things. Red means stop and pray for courage. With God on my side never be discouraged. Blue means it's okay to feel sad. Yellow reminds me to slow down and pray. Thank God for His blessings every day. Orange, this stone is very bright. God is with me, there's no need to feel fright. God shows me that He loves me so. Last Sunday I taught your David and Goliath lesson. The 2 - 5 yr. olds had a blast! We sat down and I told them what we were doing, though it was pretty obvious from the 8 foot giant on the wall (could only do 8 feet tall as hit the ceiling)! Then we sang, Only A Boy Named David and talked about David and about the giant. Then I read the story in the Bible and we discussed it as we went. 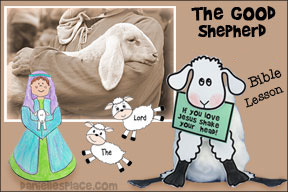 Started with David as a shepherd and I related that to them being shepherds last time (Lost Sheep lesson). We talked about our fears and then did the memory verse -The battle is the Lord's. 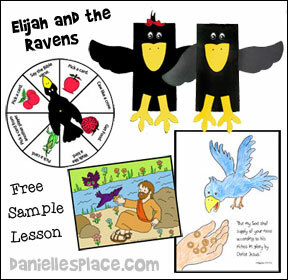 Karyn Henley has a song called Great Big God that works well with this lesson. Then we went to table and made the little stone books. I used the poem about the colors and made the cover brown with title and author and then next page I made was the first part of poem and then each page after was a stone color. We went through the booklet while they laced the books together. Then I passed out brown lunch sacks and we made the pouches for carrying their rocks. We laced the top closed and then used yarn to tie the sacks around their waists. I passed out pre painted rocks to go in their bag and, of course, we discussed the rules of safety with the rocks. When they finished they could go to the drawing of the giant on the wall and I took their picture by the giant. Then they got two tries to hit the giant in the forehead with ping pong balls (our rocks). I had six balls all together so I would take a picture of the child, let them try to hit giant and then find their balls while next child had their picture and so on. Can get done faster. My husband had the ones waiting sitting on the floor nearby so they could watch and he used a boy stamp and a girl stamp and stamped their hands. We told them that this stamp on their hands would remind them today that we don't have to be scared because God is always ready to help us. After that we had a snack and ate rainbow colored fish snacks and talked about the colors. Then when they were done with snack and had their things in the trash they got to have another try at Goliath until time to go. I wanted to let you know how much I am enjoying your site and how helpful it has been for my lessons in treasure time. For the lesson David and Goliath I thought of a cute bowling game for the kids to use, to give a little different spin on things. 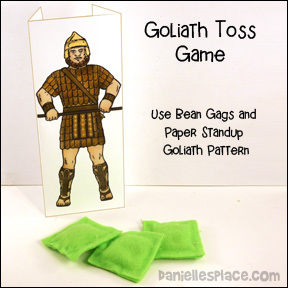 I use the pattern for the giant soldier from the story, Shadrach, Meshach, and Abednego. I printed the pattern from the large file, colored him, and than taped him to the head of a small child-size bowling pin. I made six in all. Each child had their own bowling pin. I gave the kids a small plastic ball and they played a game trying to knock over Goliath. The younger kids, 2 - 3, had a fun time with this. It got out a lot of energy and yet it still tied into the lesson. For the older children, 4 - 5, we did the whole bowling set with just one Goliath at the head pin. I tried to make it so they would all have fun and be challenged. If you don't have bowling pins for children you can use empty clean, two-liter bottles for this game as well. This ideas was sent in by Pamela Holloway. We had fun with this lesson as with all the others. The children loved making the stone books and the larger stones were put in a specially designed envelope. Start with a cookie round and sweet. Add cream cheese icing to this great treat. Each with a message and also delicious. Strawberries are red and blueberries blue. Yellow pineapples & oranges, too. To our mini pizzas, pretty and luscious. How God cares for you and loves you so. Five little colors remind me of things. Red means STOP! Pray for Gods power. He's Lord of my life and my strong tower. Blue tells me some days Ill feel sad. But with Gods help, Ill soon be glad. Thank you God, for blessings each day. The color orange brings smiles to each face. God leads me to win lifes race. Tell others how he loves them so. 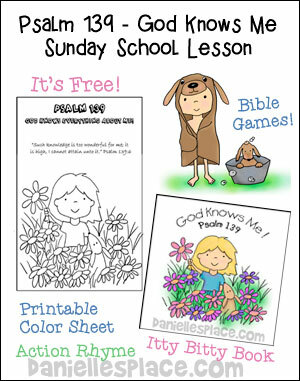 The lessons on this page can be found on The Resource Room a subscription site designed specifically for Sunday School teachers and childrens ministry. Join the Resource Room today! 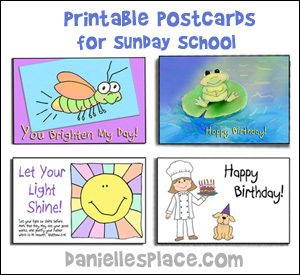 You will receive online access to complete, easy to prepare, bible lessons, new craft ideas and patterns, outreach ideas to help you grow your Sunday school class, church bulletin board ideas and much more.